Our Prince Wolkonsky lilac tree/shrub has the usual heart shaped flowers of most Syringa but the distinguishing features of this plant are the double red to pink flowers that make a bit of an entrance around late Spring to early Summer. You might expect a plant that gives the impression of being Royalty to be of extremely high maintenance and see their likeness on stamps. Trees Online can confirm that none of this is true at the time of going to press/print/uploading to the website. To confirm, Prince Wolkonsky is low maintenance and taking a small picture of it and affixing it to the letter of your mums birthday card will only get you a visit from the stamp police. Considered to be a plant with highly fragrant flowers which is a subjective statement to make because it depends on lots of other variables e.g. the flowers are highly fragrant unless your flatulent dog is closer than the flower is. 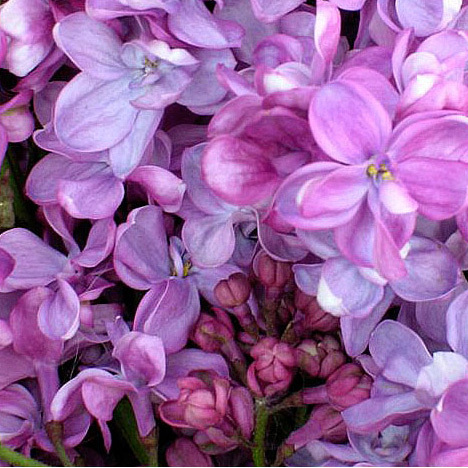 So we cannot guarantee high lilac fragrance to every person that buys one, only suggest that under the right conditions you would smell something nice. The best way to enjoy our Syringa Vulgaris Prince Wolkonsky Lilac tree / shrub is to get to know it better. Then it may let slip that it will be ok in most well drained and fertile soil conditions but as with most Syringa, does well in chalky soils and full sun conditions. Our Prince Wolkonsky lilac trees/shrubs are considered UK fully hardy. This is not because it has a friend called Stan Laurell but because it will tolerate an "average" UK winter. Another reason to buy our Prince Wolkonsky include, you can tell your friends you are going home to a Prince and that you are looking forward to smelling the pink/purple dangly things and that as trees/shrubs go, this is one of the most well behaved as has never been featured on Crimewatch or even arrested. Supplied in a 7-12 litre pot between 50-120cm and will be between 2 and 3 years old. No one has written anything about our Prince Wolkonsky Lilac tree yet but if they did, they might mention that it is definitely very Lilac like and does all the usual things a Lilac would do and has not caused them any unexpected problems such torment the cat. Most Syringa from Trees Online will be multi-stem or shrub like unless otherwise stated. If it is important to you, please state at checkout which is your preference. All Syringa (Lilac) trees, have been grafted to produce a better tree in terms of vigour and earlier flowering. The rootstock used is a special selection (S. tomentella) which reduces suckering to a minimum. S. vulgaris is not used as a rootstock for this reason.